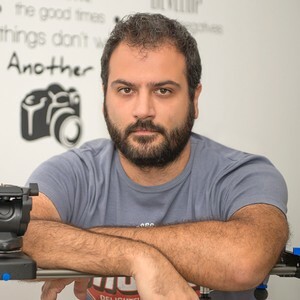 I was born in Thessaloniki, in the north part of Greece and my first involvement in photography was because of my father, who is a photographer (of course...), so from a very young age I was helping in a studio and in still life photography mostly, learning all the "secrets". 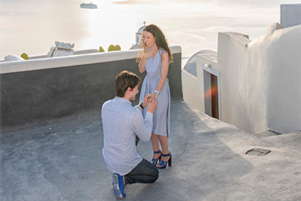 The last 7 years my base is in the beautiful island of Santorini, working as a wedding photographer, trying to capture this special day for you and accomplish a result that will meet your expectation of your dream photography session in Santorini. My style in photography is more photo journalistic, I like to capture natural images and creative portraits but I am willing to follow your needs and personal style, for more editorial photoshoot. Generally, I cover all the mainland in Greece, not only Santorini, but I can also travel international upon request. I am located in Santorini, Greece and there is a travel fee when I travel abroad. I like most a photojournalist style, but I am willing to follow the need for an editorial wedding. The typical package starts from the preparation of the wedding, the ceremony, a photoshoot with the couple around the place and ends with the reception.The price depends on the hours mostly. My studio is in Santorini and it's open all year around. I use Skype but I prefer email contact. I have a Diploma of Photography.